Steampunk is a subculture-inspired design style featuring an eclectic mix of vintage industrial machinery, post-apocalyptic science fiction and Victorian era elements. Think antiques with a worldly flavor and convertible or refurbished furniture and accessories with a 19th century mechanical vibe. For the self-expressionist who craves a creative, outside-of-the-box decorating scheme, steampunk might be right up your alley. Start by giving the room a Victorian-industrial feel with muted earth tone colors on walls. Include accent walls or sections of exposed brick, reclaimed wood or metal panels with an aged patina. Faux Panels - Find antique brick and reclaimed barn board panels made from lightweight polyurethane that you can easily install yourself. Zahner - Zahner offers a large selection of patinated metal surfaces for interior design applications. Sherwin-Williams - Choose from a late Victorian interior color palette featuring warm grays, shades of brown, and muted purples, reds, and greens. Look for furniture with dark wood finishes, leather or metallic upholstery, rusted metal, and moving parts like wheels or gears. 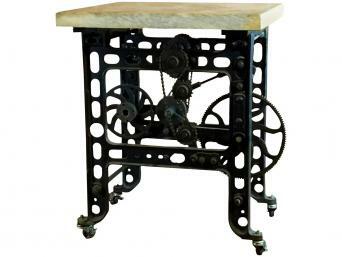 Repurposed or refurbished furniture hits the mark with steampunk style. Once your backdrop is in place, bring in offbeat vintage and antique accent pieces like the items found at the following resources. 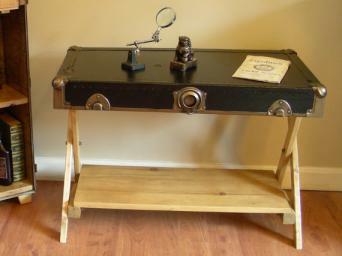 Create a steampunk vignette in your family room by positioning the end table next to a wall. Lean the framed vintage art prints against the wall and arrange the other decorative objects in front of them, placing the lamp in a rear corner. You could also place the table next to a quirky accent chair and hang the vintage art prints on the wall behind. LED Industrial Table Lamp with Clock - An excellent conversation piece for a home-office by Van Dusen Clockworks, it consists of various antique and vintage components, including a large gauge repurposed into an actual working clock and individual LED lighting components in the base and the top of the lamp. Electrostatic Instruments of Conduction - Very sculptural in appearance, these spheres of brass, copper, and chrome are supported on slender Lucite shafts secured in wood or copper bases. Does your office or workspace exist as part of a larger room? Consider the Selection Antique Chains and Pulleys as an industrial room divider that won't soon be forgotten. Each length of heavy chain has an aged patina that fits beautifully with steampunk style. 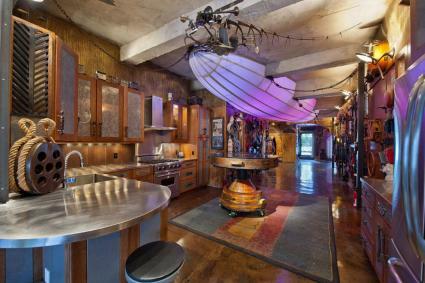 Houzz makes it easy to get your steampunk all in one place. Here, steampunk décor is sourced from multiple suppliers and when you see something you like, you can purchase it right on the spot. Industrial Floor Lamp - Made from black iron industrial piping, it stands 5'4" tall and features a 40 W Edison bulb, a rotating faucet handle on off switch and a vintage cloth covered cord. Luca Reclaimed Wood Rustic Iron Industrial Loft Side Table - Constructed from reclaimed pine and iron, this side table makes the perfect resting place for a drink or reading material. Howard Miller 30" Large Wall Clock - Made from warm, gray iron and featuring antique brass finished gears, this clock makes a perfect wall accent hung nearby the chair. Work the clock in if it makes sense with the architecture and placement of furniture in the room. Otherwise, the chair, lamp, and end table make a cozy reading nook in any empty corner, alcove, or small empty space. For the most brilliant illumination ideas in industrial lighting, check out Edison Light Globes. 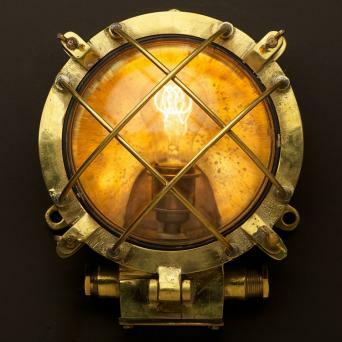 These artfully crafted vintage style light fixtures are perfect for bringing a steampunk vibe into any room, especially kitchens and bathrooms. Not only can you find assembled fixtures, you can also buy lamp parts and in true steam punk fashion, design your own one-of-a-kind light fixtures. Plumbing Pipe Wall Lamp E27 And 3 Bulbs - Made from steel pipe and cast fittings, the lamp works with a variety of filament bulbs. Brass Ships Round Diagonal Cage Bulkhead Light - Crafted from solid brass, these lights were salvaged from 1950s era ships. Bronze Long Bulb Cage Wall Pendant Lamp - This rustic yet elegant fixture combines the look of a wall light with a hanging pendant, featuring a custom-made cage, colored braided cable and tubular shaped filament bulb. Copper Mirror X-Ray Shade Booth Pendant - these genuine 80-year-old antique x-ray copper reflecting shades would make a stunning accent hung over a small kitchen island or kitchen table. Outdoor Galvanised Plumbing Pipe Conservatory Light - this trio of industrial pendants can be ordered in galvanized, rusted or a carbon black finish and aluminum or brass finish on the cages covering the vintage filament bulbs. Large Vintage Smooth Brass Ships Deck Light - salvaged from the massive ship breaking yards in Bangladesh, these dome shaped pendants are suspended from large ceiling hooks and rusty chains. Repurpose an old cabinet into a bathroom vanity or an old factory cart into a kitchen island. Both of them will complement your industrial lighting and enhance your steampunk theme. Vintage consignment stores like Chairish are a great resource for piecing together your own steampunk inspired look. Another good starter piece for a steampunk-themed living room is a vintage trunk and Chairish has plenty of them to offer. Henry Link Trading Co. Leather Wing Chair - This modern reproduction of a rustic leather wing chair would have been the envy of any well-to-do Victorian household with its outer covering of distressed and embossed crocodile leather, old brass nailhead trim, and carved ball and claw feet. Antique Victorian Tufted Walnut Settee - The unusual profile of this sofa makes it appear as if a chaise lounge and high-backed chair were morphed into one. Other signature elements of steampunk style include antique maps and terrestrial globes. Depicting 16th-century knowledge of oceans, continents and islands, this cool Italian globe doubles as a rolling bar cart, making it a perfect floating accessory you can use in the living room, home office or master bedroom. Frame antique maps and hang them as wall décor. Somewhere in your steampunk-themed room, find a resting spot for a quirky riding hat, top hat, or aviator cap with goggles. Make it unique by adding your own embellishments and don't be afraid to plop it on your own head if it suits your mood during your next cocktail party.